I first got the idea to draw profiles from a 19th century engraving of a traction engine that had been hand coloured. It seemed to be the perfect style of drawing that could be drawn on a computer with the available program on my Applemac at the time, without actually looking too computery. I did have to abandon the flat colours for a more photographic finish to clarify the curves of various body panels. Over a period of time the technique evolved into a more realistic and detailed style. One of the advantages of drawing on a computer apart from the obvious benefit of only having to draw a particular component once is one can revisit drawings done many years ago and apply learned improvements in technique and refine detail without having to start again. The profile-style here is reminiscent of the car profile illustrations done in the 1960's, though being produced with more conventional techniques, gauche water colour, etc, were looser and more forgiving when it comes to details such as suspension and wire wheels. Ordering Please only ask for a quote for cars already drawn and always include photographs showing the particular variant the car is. I cannot quote for cars that have not been drawn as the original base drawing takes over 40 hours I'm already about 2 years behind trying to complete a wish-list of future car drawings. By all means inquire if your car is on that wish-list or already started but it may be some while in the future before it's available for portraiture. ABOVE: typical features that can be changed or added to create a Technical Portrait. Essentially car profiles are blueprints that are coloured. They have no perspective and are drawn to scale with measurements taken from a real car. They cannot be achieved by tracing over a photograph. I have no access to original blueprints (the various blueprint sites mostly contain inaccurate or low resolution images - some have even been copied off this site). It is quite a long process just getting the basic drawing right from my own measuring and observations - up to 40 hours for a post-war car and 60 hours for a vintage or pre-war car.  As an example to how a camera distorts things if one was to draw an object like a ruler square-on from observation or 'by eye' one would probably draw two parallel lines and draw equidistant marks upon it. However, if one was to actually trace off a photograph of a such an item one would end up with a cigar shape with the measurements upon it unevenly spaced getting closer towards each end. Square objects tend to end up slightly barrel shaped and in the case of a car the curve of the roof and sides will be exaggerated if copying or tracing off a photograph. To get nearest to the correct shape of a car with a camera one would have to use a telephoto lens from 100 or more yards away. For those puzzled by the apparently random page numbering... after about page 20 it's more to do with how recent the drawing of a particular car body is. The larger the number the more recent the original drawing is. 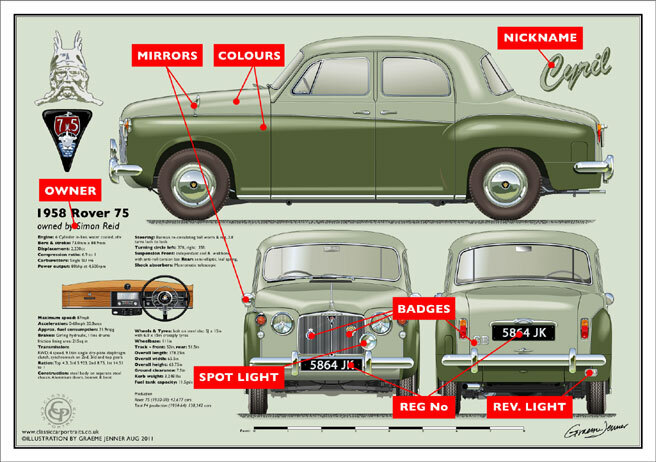 The larger text: ©www.classiccarportraits.co.uk appears at the base of the latest uploaded or amended drawings. This, as well as the larger watermark will of course not be on any final prints.